Language Log » Mobile morphology: UNwrong'D or just plain wrong? Mobile morphology: UNwrong'D or just plain wrong? A new advertising campaign by the cellphone company Boost Mobile is a real head-scratcher, in large part due to its creative (possibly too creative) experimentations in English morphology. Morphological innovation has driven some other recent ad campaigns, notably the creation of "Snacklish" by the good people at Snickers (discussed by Arnold Zwicky here, linking back to earlier morpholiciousness from Snickers here). Both the Snickers and Boost Mobile campaigns revolve around self-conscious neologisms, but the similarity ends there. Whereas Snickers introduces lexical blends fusing a variety of words and word-parts, Boost Mobile exploits one particular morphological frame: un____ed. It’s a sign of the times. Money doesn’t go as far as it once did, and consumers feel helpless and frustrated. When prepaid wireless providers add in activation fees, overage charges and extra costs for services like voicemail and roaming, consumers grumble and accept it. They’re wronged. They feel it. And they want a change. Starting today, Boost Mobile is taking a stand against the abuses suffered by wireless customers and launching a new marketing campaign aimed at showcasing how its new ‘Monthly Unlimited’ plan offers consumers straightforward pricing and predictable payments with no additional Telecom Taxes, activation, roaming, traveling or long distance fees. An edgy nationwide campaign portraying humorous situations that most would consider ‘wrong,’ Boost Mobile’s new ‘Unwronged’ marketing takes aim at its competitors’ shortcomings and their negative impact on consumers. 9. a. Adjectival forms in -ed, from substantives, of the type unbearded, unbodied, unfeathered, etc. … The usual sense is ‘not provided or furnished with’, but sometimes ‘not affected by’, ‘not treated with’, etc. ; in the latter case the use is not clearly distinguishable from the purely participial. 8. Verbal substantives, participial adjectives, and agent-nouns are naturally formed from verbs in un- as from simple verbs. These forms begin to appear in the 14th century, and become common in the later language. Many of the past pples. and ppl. adjs., as unbent, unbound, undressed, unfastened, etc., coincide with formations in which the prefix is UN-1, and the distinction in meaning is not always sufficiently clear to admit of an absolute separation between the forms. In the case of unwronged, we might expect it to fit OED sense 8 of un-1, simply the negative form of wronged ('not wronged'). But when Matt Carter says "Everyone wants to be unwronged," it suggests that the reversative un-2 is at play here: the "wrong(ing)" inflicted by other cell-phone companies can be reversed by switching to Boost Mobile. The company has continued the "unwronging" theme by issuing a press release headlined "Boost Mobile Helps Unwrong the Environment." Again, the idea is to reverse or obviate a "wrong" condition (in this case, by encouraging consumers to recycle or reuse old cell-phones rather than throwing them away). Like unwronged, the ad campaign's other fillers of the un____ed frame have their own ambiguities. UNoverage'D and UNcontract'D would seem to fall under OED sense 9 of un-1, along with unbearded and the like. Here un-X-ed can be understood as "unaffected/unburdened by X" where X is a noun: the overage charges and cumbersome contracts typifying other cell-phone plans are simply not present in Boost Mobile's unlimited prepaid plan. But if UNwrong'D is intended as a reversative, perhaps these are too: overage and contract represent conditions that can be undone (unwronged) by switching plans. But that would require understanding (un)overage and (un)contract as ad-hoc denominal verbs — something like (un)silo, to take an example from management-speak. 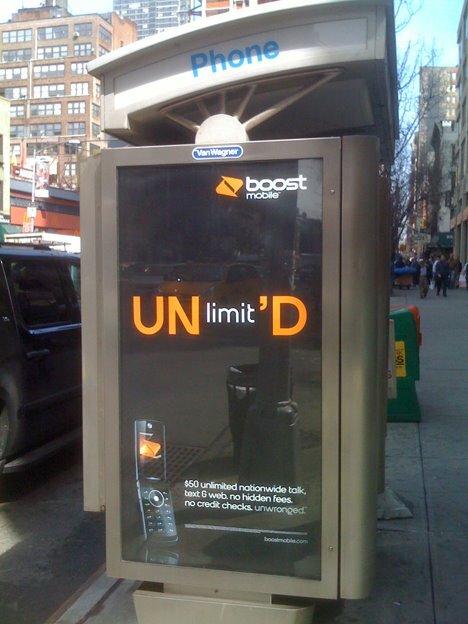 Of course, unlimited is a preexisting participial adjective of the simple negative un- variety ('not limited'). It's hard to think of this as related to a reversative example like unwronged, beyond the surface similarity. The idea here seems to be to get people absorbed in figuring out the "puzzle" of the ads. Once they get the rebus construction, they can then try to figure out what the revealed words have to do with Boost Mobile. But again we have the ambiguity seen in UNwrong'D. Are these simple negatives ('not screwed,' 'not hosed') describing the happy condition you'll be in when you sign up for Boost Mobile? 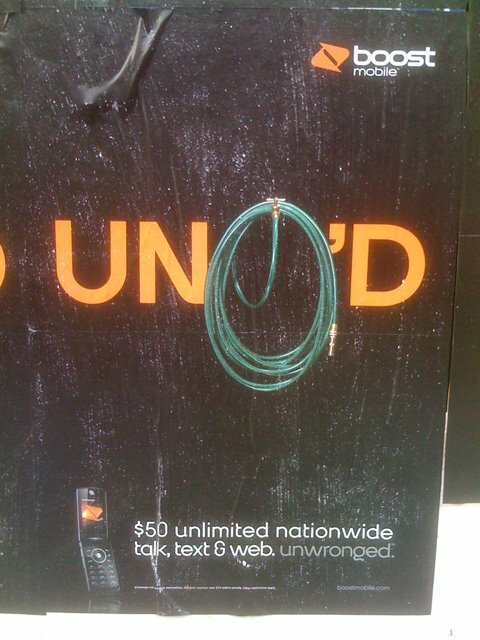 Or are we dealing with more ad-hoc reversatives (Boost Mobile will unscrew/unhose you)? These last examples strain the limits of my analysis. I can only imagine that the ad agency team sat around in a brainstorming session, coming up with a list of "wrongs" that Boost Mobile could rectify. "Overages!" "Contracts!" "Working more hours to afford more minutes!" Sure, why not? Once you accept that any old noun like overage or contract can get pressed into service in the negative/reversative frame of UN____'D, then why not plug a massive gerund-participial clause in there just for the heck of it? Here in Australia one of the major car insurers (NRMA) has been running an ad campaign for a few months where the main slogan encourages everyone to "unworry" and insure our cars with them. This will enable us to "unpay more" (ie. pay less) for our insurance, which "un-costs the earth". See http://www.unworry.com.au. The whole thing really gets on my nerves, because the language is really contrived – it seems very counter-intuitive to say "unpay more" when you mean "pay less". (Also the ads all have a carefree, whimsical nature that I hate). But the coincidence is a strange one… same ad agency, maybe? Or two ad agency people going to the same creative seminar a few months ago? UNoverage'D and UNcontract'D work worse than UNwrong'D for other reasons. Seeing as the apostrophe is not part of a possessive construction, the reader expects it to indicate the omission of one or more letters. Standard English morphology would yield "unoveraged", so UNoverage'D does not omit any letters, so its apostrophe has no purpose. The form "'D" suggests to me the Early Modern English convention of using the apostrophe to indicate the omission of the vowel sound. However, this form was not used when the vowel was pronounced. We don't get *want'd or *start'd, so UNcontract'D likewise looks wrong. I'm unfamiliar with the term "overage" (with unstressed /a/) so UNoverage'D looks to me either like an error for UNcoverage'D or I assume other companies have an issue with the AGE of the customers. Here in Australia one of the bigger insurance companies, NRMA, has been running a campaign for the last few months telling us all we can "unworry" if we insure our cars with them. We would "unpay more" because their insurance "uncosts the earth". More here – http://www.unworry.com.au. Personally I find the whole thing really annoying, because of the un-intuitive processes you have to go through to work out the meanings of the things they're trying to say. (Also the whole campaign has a really whimsical theme that gets on my nerves). perhaps? The first option obscures the common aspect of the ad campaign, and on Advertising Log, Dr Advertiser would be saying how this hurt brand-name recognition. The second option obscures the pronunciation and harms recognition of the word “overage”, and instead of this post, Benjamin Zimmer or one of his fellow bloggers here would be criticising that, too. As was noted in the original post, as soon as you they didn't need the consistent appearence for the campaign to work, they dropped it. The apostrophe was an excellent tool for the job, given the constraints of the English orthography. I think anyone who disputes that is missing the point of advertising campaigns. And probably language, too. Sorry for the out-of-order reply and serial posting; Matthew's post hadn't appeared yet when I started replying. The whole thing really gets on my nerves, because the language is really contrived – it seems very counter-intuitive to say "unpay more" when you mean "pay less". I've been noticing a perhaps increasing tendency for derivational affixes and especially prefixes to act more and more like prepositions (or something; acting on a phrase, instead of a word). It certainly wouldn't surprise me to hear it in speech. I'm pretty sure I've used it too, both in speech and online in instant messages (where I, unlike NRMA, include a space and maybe a hyphen: “un pay more” or “un pay-more”). I think there was a recent posting here at Language Log recently about a latin preposition that doubled as an affix, that was borrowed as an affix into English on a bunch of words, and during the last century began acting more and more as a preposition in English, too, having been backformed from the prefix. It makes sense if you look at UN'D as performing a function like a mathematical operator. You take whatever thing you want and apply the operator to it. The operator performs a function on it, in this case apparently to reverse the thing or situation. The emphasis on UN__'D (and lack of emphasis on whatever is between) seems to imply that, even if the ad agency didn't consciously intend it. To my BrE ear "unwronged" sounds natural and leaves me entirely unfussed. I predict a long and happy life for the term. @felix: I think your analysis holds much water. I sympathize a bit with doing this to words that end in a, because adding -ed would cause a vowel combination usually pronounced differently. Tuxedoed is manageable; patinaed is confusing. But I suspect that it's never correct. Is one simply not supposed to make a -d formation out of words that end in a? Adrian: overage = over plus the suffix -age. When I saw the three forms together, I immediately thought of Milton's "unrespited, unpitied, unrepriev'd" and shortly thereafter of Shakespeare's "unhouseled, disappointed, unaneled". Adrian: "overage" is defined by the OED as "A surplus, an excess; an additional amount; (spec. in business) an amount (of goods, money, etc.) greater than that estimated; a profit." In this case it refers to using more than the maximum number of minutes you have paid for, and represents the company's profit and your loss. I had only seen this campaign out of the corner of my eye on bus shelters. I remember thinking that Mr. Ban was doing some very strange things with Unicef funds. It's a relief to be set right on this. I figured that UNlimit'D was about a phone company. Some of the others would have been more obscure. But it seemed clear to me that they were claiming to be without limits unlike their competitors. The ones with phrases inside them strike me as assuming. felix brings up an interesting angle with the use of a hyphen to syntactically pack information with his take on "un pay-more." Though it is not by any means kosher to prescriptive grammarians, long hyphenated-chain-terms show up, and people understand what they attempt to do (felix also uses one: "yellow-or-white-on-black thing"). Would the long ing-participle phrases be more acceptable were they to be hyphenated? I think the interesting thing about the design template is that the different colors, capitalization, and 'D "suffix" serve to separate the phrase in the middle enough that such hyphenization is not necessary – one's eye already binds the information together as one constituent. The Boost Mobile campaign would appear to be doing a better job making their "playful" use of English intelligible… or at least at more immediately intelligible than the NRMA example. The ambiguity of un- with a past participle can occur even if the past participle doesn't end in -ed. I first noticed it with undone. In "My work is undone", undone can be either un- + done or the past participle of undo, so we can't tell whether the work was never done at all or was done at some point and then undone. The British for "overage" is "excess minutes". cf. insurance excess. I'm surprised comments has gone this far an no one has explicitly used the word branding. This is Branding 101: Getting people to, as felix said early on, "recognise the template." I think this a rather good marketing campaign because it can so easily slip itself into everyday conversation, the way "Where's the beef?" 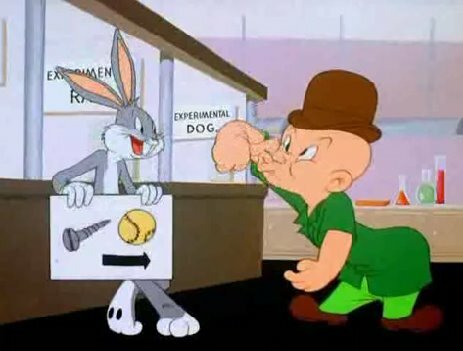 and "That's a spciy meat-a ball!" so easily found homes in conversations about non-meat products — only moreso. 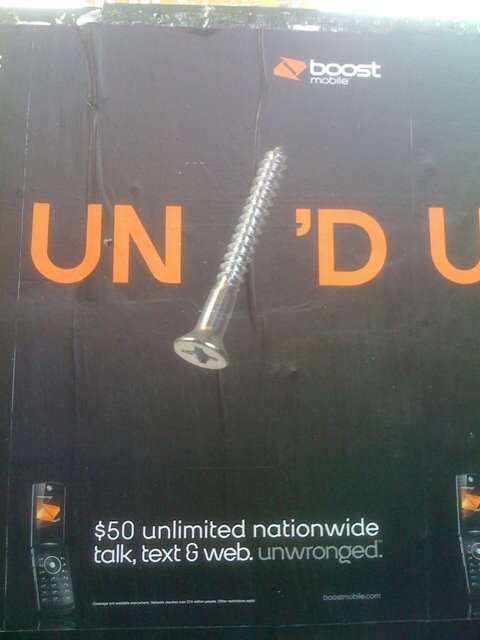 With wide-reaching success in this campaign, every time someone uses a "legitimate" un____ed word in a conversation, it acts as a subliminal advertisement for Boost Mobile, reinforcing their image in your mind. I don't think it will be long before we start hearing just the branding, UN'D, used as a verb by itself, though, as in "Mark sent the wrong file to Ben, but I un'd it for him." On a side note, "boost" is (or was?) a synonym for "steal." I wonder if the people in this company took that into consideration when they came up with the name, focusing on the idea that they're going to steal customers from other phone companies. With a name like "Boost Mobile," though, I think this company is just prime for an joint campaign with the Grand Theft Auto people. Julia K: afaiaa 'd is perfectly acceptable in those awkward situations. I think that we can all argue about how things like "unwronged" (UNwrong'd) can technically mean one thing or another; however, I myself think it's pretty clear what the intended meaning is. I think the campaign is incredibly clever and catchy. I understand that it may be overstepping its bounds by creating these new words. But we all understand what they're shooting for. Their use of bound morphemes (un and ed) seems to be standard practice in advertising these days (think: drinkability). UNoverage'd and UNcontract'd seem to me to clearly signal that there are no overage charges/contracts, just as a word like Drinkability obviously refers to the ability of a certain beverage to be consumed. Personally, I think it's a VERY clever campaign that shouldn't really be raising too much concern. 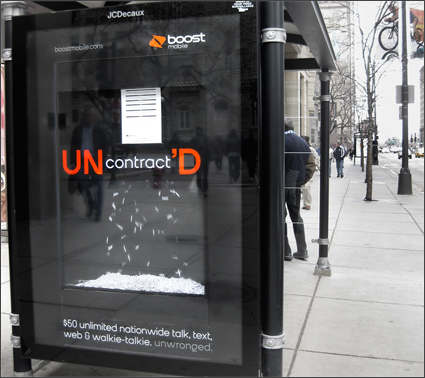 The whole Un’__’D campaign for Boost Mobile seems to be very clever. I haven’t seen many of them, but they would definitely make me pay attention, at least enough for me to question what the campaign is about. I don’t think the creative geniuses behind these advertisements intended to ruffle feathers in the grammar world because it’s all about marketing here. I must admit that I don’t really understand the “UNworking more hours to afford more minutes'D” and “UNhiding your kid's phone at the end of the month'D”. I have translated them the best I can and came up with Not working more hours to afford more minutes (I’m unsure of the role of the ‘D here) and Not hiding your kid’s phone at the end of the month ( Again, unsure of the ‘D). These ads make me think of the Snickers words (Satisfectellent, Nougatocity, Hungerectomy, Substantialicious) and how branded morphology has become. Initially, I was very startled to see these strange words on the side of the Snickers wrappers but now whenever I hear or see Nougatocity or Substantialicious (which is not often) my mind goes to Snickers. I dont know who's doing the advertising for Boost in Australia now – but the founder from way back did some great spots for another carrier in the states. If you want a laugh go to you tube and search for Amp'd Mobile Bathroom. Sadly, as with a lot of seemingly great ideas this one is UNoriginal. As pointed out an insurance company here in Australia, NRMA, has been running a campaign for over a year now based on the power of Un-ing things. Wonder if it's just a coincidence or something more UNscrupulous.